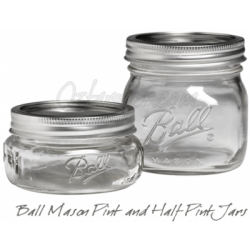 Ball Wide Mouth jars are available in 4 styles: Half Gallons, Quarts, Pints and a Half and Pints. Kerr brand wide mouth jars are available exclusively in the Half Pint version only. The Elite jars in a separate category also take wide mouth lids. The wide mouth nomenclature denotes the size of the mouth opening: the lid is a 86mm continuous thread size. These jars are compatible with our single one piece high heat gold lids and all other accessories designed for wide mouth jars. The wide mouth jar is a popular choice for preserving, with the larger mouth allowing room to position fruit for optimal presentation in the jar and for ease of filling and cleaning. The pint and a half jars are also popular for drinking and smoothies. Wide mouth jars of pint and a half size and smaller have straight sides and so are suitable for freezing. All wide mouth jars have embossing on all parts of the jar and there is no room on the side of the jar for a label. They are also embossed with Wide Mouth to distinguish them from their regular mouth counterparts. Kerr Wide Mouth Half Pint Clear Glass Preserving Jars Capacity: Half pint = 8oz = 240mlSize: 80mm highMouth size: 86mm Wide MouthCase size: 12Suggested uses: chutneys, jams, pickles, small drinking glass, floral displays, candle makingThese size jars are very popular for pressure canning, particularly fish such as tuna.Suitable treatment methods: dry storage, vacuum seal, fermenting, water bath, pressure can, freezeEach jar comes complete with 2 part lid consisting of a flat disk incorporating a seal (the lid) and a twist on ring to hold the lid ..
Ball Wide Mouth Pint Glass Preserving JarsCapacity: Pint = 16oz = 440ml Size: 120mm high Mouth size: 86mm Wide Mouth Case size: 12Suggested uses: chutneys, jams, pickles, drinking glass, floral displays, candle making, fermented foods or glass storage.Suitable treatment methods: dry storage, vacuum seal, fermenting, water bath, pressure can, freezeEach jar comes complete with 2 part lid consisting of a flat disk incorporating a seal (the lid) and a twist on ring to hold the lid in place for processing (the band).Lids are recommended for single use only if the jar..
Ball Wide Mouth Quart (950ml) Glass Preserving Jars are ideal for fresh preserving whole fruits and vegetables like peaches and green beans.Enjoy homemade pickles year round with the famous Ball Mason glass jars.We find the wide mouth quart jars to be a very handy size and after regular mouth pints, we consider it to be the "must have" jar for preserving. They are perfect for summer stone fruit; halves or whole straight into the jar, as well as for pears and apples, preserved lemons, and much more. 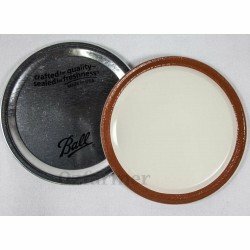 We prefer wide mouth quarts for our chunky soups and casseroles when w..
Ball Elite Wide Mouth Half Pint Jars: case of 16 bottles Capacity: Half pint = 8oz = 240ml Size: 55mm high Mouth size: 86mm Wide Mouth Case size: 16Suggested uses: chutneys, jams, pickles, small drinking glass, floral displays, candle makingSuitable treatment methods: dry storage, vacuum seal, fermenting, water bath, pressure canBall jars cannot be baked or used in a microwave.Each jar comes complete with 2 part lid consisting of a flat disk incorporating a seal (the lid) and a twist on ring to hold the lid in place for processing (the band).Lids are recommended f..
Ball Elite Collection Wide Mouth Pint (450ml) Glass Preserving Jars Capacity: Pint = 16oz = 440ml Size: 95mm high Mouth size: 86mm Wide Mouth Case size: 16Suggested uses: fruits, chutneys, jams, pickles, floral displays, candle making, glass storageSuitable treatment methods: dry storage, vacuum seal, fermenting, water bath, pressure canEach jar comes complete with 2 part lid consisting of a flat disk incorporating a seal (the lid) and a twist on ring to hold the lid in place for processing (the band).Lids are recommended for single use only if the jar is heat pro..
By popular demand! Due to the overwhelming popularity of the heritage blue pints released in 2013, Ball has now expanded its product line to include blue jars in a range of shapes and sizes!The wide mouth pints are approximately 475ml and are a popular size for jams, salsas and jellies. Flower posies also look fabulous in these blue coloured jars.The jars come in a box of 4 with the standard Ball 2 piece lid and as the colour is in the glass and not painted on, the jars can be used for all your favourite preserving recipes.120ml high, takes a wide mouth 86mm lid. Capacity 16oz is..
By popular demand! 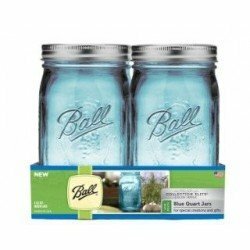 Due to the overwhelming popularity of the heritage blue pints released in 2013, Ball has now expanded its product line to include blue jars in a range of shapes and sizes!The wide mouth quarts are approximately 950ml. Flower posies also look fabulous in these blue coloured jars. The jars come in a box of 4 with the standard Ball 2 piece lid and as the colour is in the glass and not painted on, the jars can be used for all your favourite preserving recipes.165mm high, takes a wide mouth 86mm lid. Capacity 32oz is approximately 950ml. The jars have the same embossing.. Suggested uses: chutneys, jams, pickles, small drinking glass, floral displays, candle making Suitable treatment methods: dry storage, vacuum seal, fermenting, water bath and pressure canningBall jars cannot be baked or used in a microwave.Each jar comes complete with 2 part lid consisting of a flat disk incorporating a seal (the lid) and a twist on ring to hold the lid in place for processing (the band).Lids are recommended for single use only if the jar is heat processed using a water bath or pressure canner. Bands can be reused.For preserving, we always recommend using ..
Ball Collection Elite Brushed Silver Wide Mouth Pint (16-oz/ 450ml) Jars capture your creativity. Perfect for sharing, this jar has a contemporary style that is ideal for creative preserving and storing.Elegant enough to take your fruit dressings, veggie and fruit salsa, luscious pie fillings, and colorful fruit syrups from the kitchen to the table, these uniquely shaped jars hold endless imagination.The Ball brand helps keep your creations fresh and beautiful!These bottles comes packaged in an attractive box, also making them the ideal gift. They are very popular with c..
Ball Wide Mouth Pint Glass Preserving Jars Half Case of 6 jarsCapacity: Pint = 16oz = 475mlSize: 120mm high Mouth size: 86mm Wide MouthCase size: 6Suggested uses: : chutneys, jams, pickles, drinking glass, floral displays, candle making, fermented foods and glass storage. 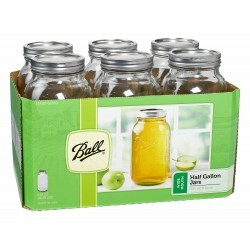 Suitable treatment methods: dry storage, vacuum seal, fermenting, water bath, pressure can and freeze.Each jar comes complete with 2 part lid consisting of a flat disk incorporating a seal (the lid) and a twist on ring to hold the lid in place for processing (the band).Lids are recommend..
Ball Wide Mouth Half Gallon (2 Litre approx) Glass Preserving Jars are ideal for fresh preserving apple and grape juices.Use the half gallon jars for fermenting vegetables using our fermenting air lock.Bottle Size: Width 85mm x Height 240mmContents: 6 Ball Wide Mouth Glass Preserving Jars 6 Ball Wide Mouth Lids with BandsQuick Tips: Hand wash lids only. Do not put in dishwasher. Dry thoroughly immediately after use to avoid corrosion. For fresh preserving, follow a tested preserving recipe su..
Kerr Wide Mouth (8-oz / 230ml) half pint glass preserving jars are ideal for fresh preserving jams, jellies and pickles. They are also very popular for pressure canning meat and fish, particularly tuna.Enjoy homemade pickles year round with these famous glass jars.These jars are the perfect size for fruit butter and for gift size jars of marmalade and jam.Note that these come standard with a silver lid and band.Lids are not stainless steel. Hand wash only. Do not put in the dishwasher. 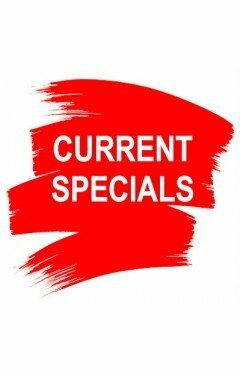 Dry thoroughly immediately after use to avoid corrosion.6 Kerr Wide Mouth Glass ..
6 x Pint 16oz Wide Mouth Jars Orchard Road Sauces Fermenting Preserves Weddings Orchard Road Wide Mouth Pint (16 oz) Preserving Jars are a premium heavy duty jar ideal for recipes such as salsas and sauces. They are also wonderful for crafts and storage and include three smooth sides for easy labelling. 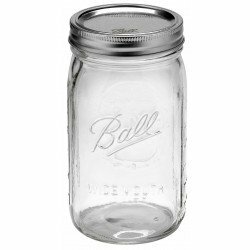 These jars are made from high quality glass which can be used for waterbath or pressure canning and are completely odour and stain proof. The jars fit other mason jar wide mouth bands and lids (86mm opening) as well as any 86mm continuous thread lid. Lids sold separately. Choose fr..
Ball wide mouth quarts hold 32oz which is approximately 950ml.Suggested uses: juices, fermented foods, cocktail shakers, food preserving, glass storage, flower arrangements and candle making.Suitable treatment methods: dry storage, vacuum seal, fermenting, water bath, pressure can.Each jar comes complete with 2 part lid consisting of a flat disk incorporating a seal (the lid) and a twist on ring to hold the lid in place for processing (the band).Lids are recommended for single use only if the jar is heat processed using a water bath or pressure canner. Bands can be reu..
6 x Quart GREEN Wide Mouth Ball Mason Jars and Lid BPA Free. Limited edition 100th anniversary of the “PERFECTION” jar by the Ball Brothers Vintage-inspired packaging and heritage green colour jars with custom embossed front and back Maintains same quality, performance and structure as current Regular-Mouth pint and Wide-Mouth quart jars Unique colour encourages incremental sales and use in trendy crafts and storage projects Second year of a multi-year limited edition series Made in the USA..
Capacity: Pint and a half = 24oz = 650ml Size: 175mm high Mouth size: 86mm Wide Mouth Case size: 9Suggested uses: juices, pickles, fermented foods, smoothies, preserving particularly long vegetables such as beans and asparagus, glass storage, flower arrangements, candle makingSuitable treatment methods: dry storage, vacuum seal, fermenting, water bath, pressure can, freezeEach jar comes complete with 2 part lid consisting of a flat disk incorporating a seal (the lid) and a twist on ring to hold the lid in place for processing (the band).Lids are recommended for single u.. This package includes 4 cases of wide mouth jars in 3 useful sizes, plus replacement lids when you want to do another batch. 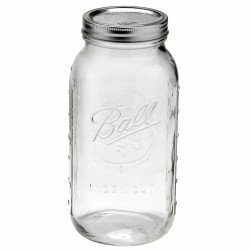 The jars are all Ball Mason jars made of high quality tempered glass suitable for waterbath and pressure canning. All jars come complete with 2 piece lids consisting of the flat lid and a screw band.For more information about the jars included in this kit, refer to our easy reference table here.Kit contains1 x case of 12 Ball Wide Mouth Quart jars 2 x case of 12 Ball Wide Mouth Pint jars 1 x case of 12 Kerr Wide Mouth Half pint jars 4 x pack of 12 r..